Current and future managers are regularly confronted with decisions that create risk in the legal environment of business. This book provides a framework for qualifying legal risk and then determining if the legal risk is worth taking. This framework begins by looking at the relationship between the firm, its suppliers, customers, owners, agents, and others in society as a whole to understand specific risks in personal injury, agreements, products, borrowing money, employees, independent contractors, and business entity selection. When the manager is aware of the magnitude of the risk and the likelihood of the risk, the manager is in a strong position to determine if the risk is worth taking. 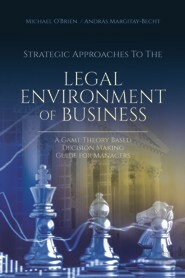 This book uses numerous applications from Game Theory to determine how risks of the firm compare to risks of another firm, an employee, a vendor and a customer. Students of business law will appreciate the black letter legal discussions of civil procedure, torts, contracts, the sale of goods, secured transactions, agency, and business associations with tax implications. Aspiring accounting students will find familiarity with many topics that appear on the AICPA exam. Managers will gravitate toward specific guidance with regard to setting up agreements with customers and vendors, creating effective human relations policies, and mitigating firm risks with regard to internal and external stakeholders. Dozens of managers provided input and experience that found its way into the selection of examples in the book ensuring real-world application for many practical business law problems. Michael O’Brien is an Adjunct Associate Professor of Business Law at Saint Mary’s College of California. András Margitay-Becht is an Associate Professor of Economics at Saint Mary’s College of California.